A medicine ball is one of the most versatile pieces of equipment you'll find in a gym. It's a great tool for a total-body strength workout, and incorporating one into your routine also helps improve your core stability, coordination, and speed. Most people walk right past the medicine balls and head straight for the dumbbells at the gym. Why? Often it's simply because they're just not sure what to do with one. But a medicine ball is one of the most versatile pieces of equipment you'll find in a gym. It's a great tool for a total-body strength workout, andÂ incorporating one into your routine also helps improve your core stability, coordination, and speed. Ready to learn? 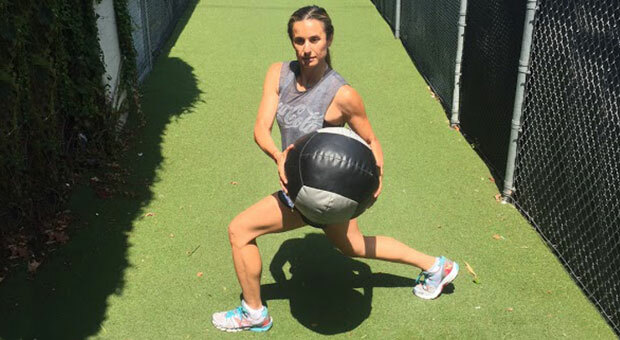 Next time you're at the gym, grab a medicine ball that weighs between 5 and 10 pounds and move through these exercises circuit-style. Rest as needed and repeat the circuit 2 to 4 times. Stand tall with your chest out, shoulders back, and feet shoulder width apart. Hold the medicine ball in front of your chest. Squat down as low as you can, keeping the weight in your heels, and then stand up and press the medicine ball high above your head. Repeat for 12-15 reps. 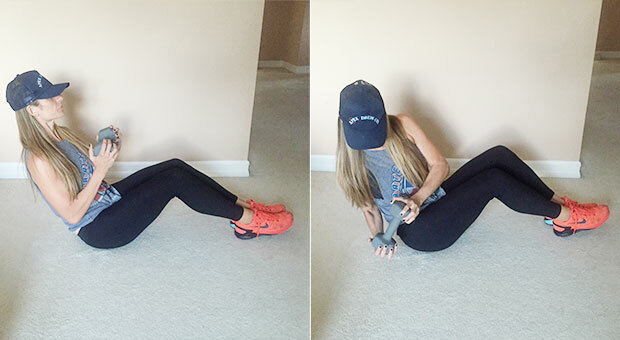 Begin lying on your back with your feet flat on the floor and while holding the medicine ball with two hands. Reach the ball above your head and tap it on the ground. From here, use your abs to sit up, while keeping the medicine ball over your head. Repeat for 10-12 reps. Sit with your feet flat on the floor, holding the medicine ball in front of your chest, and leaning back slightly. You should feel your core engage the further you lean back. From here, twist your torso from left to right, tapping the medicine ball on each side of you as you move back and forth. Repeat for 12-15 reps per side. Get into a push-up position, keeping your core tight, with your right hand on the floor and your left hand on the medicine ball. Perform a push up and then roll the ball from your left hand to your right hand, placing your left hand on the floor and repeat. Perform 4-5 reps per side. You can also do this from your knees, but make sure that your hips are in alignment with your back. Start with your feet shoulder width apart, holding the medicine ball in front of your chest. Step out with your right foot and lunge down until your left knee is about an inch from the ground. While youâre in this position, rotate your torso to the right before stepping your left foot forward. Repeat with the left leg until you have completed 10-12 reps per leg. Stand with your feet shoulder width apart, chest out, core engaged, and shoulders back. Hold the medicine ball high over your head. Keep your elbows tucked next to your ears and slowly allow your arms to bend, lowering the medicine ball down to your upper back, behind your neck. Press through your triceps to push the medicine ball back above your head. Repeat for 15 reps.
Jennifer Cohen is a leading fitness authority, TV personality, entrepreneur and best-selling author of the new book, Strong is the New Skinny. With her signature, straight-talking approach to wellness, Jennifer was the featured trainer on The CWâs Shedding for the Wedding, mentoring the contestantsâ to lose hundreds of pounds before their big day. She appears regularly on NBCâs Today Show, Extra, The Doctors and Good Morning America. Connect with Jennifer onÂ Facebook, Twitter, G+ and on Pinterest.